Hormonal changes experienced during pregnancy as well as peri and post menopause. Blepharitis as well as rosacea of the face. What should I do if my doctor diagnoses Dry Eye Disease? Be honest and share your story. We will listen! In mild cases, using artificial tears may be helpful. It’s best to follow up with our office to ensure that all is well. In progressing cases where you feel symptoms and we see eye signs, our trained Ophthalmologists and Optometrist will create a customized treatment plan that may include medicated drops such as Restasisand Xiidra along with many other technologically advanced procedures like LipiFlow, PROKERA, or short/long term drainage inserts. Reduce or limit electronic device screen time for both adults and children. Wear glasses/sunglasses when outside to reduce wind exposure. When wearing makeup, avoid waterproof mascara and eyeliner as they contain pine tar/retinol that can irritate the eyes. If you smoke, make an attempt to quit for yourself and those around you. Switch to single use daily contact lenses. Use the front defroster/floor setting in your car to reduce forced air exposure to your eyes. TrueTear® is a breakthrough treatment that provides relief from chronic dry eye disease. It relies on state-of-the-art neurostimulation technology to help the eyes produce more of their own tears, so they stay moist and comfortable. In the past, neurostimulation technology has been proven safe and effective in devices like pacemakers, cochlear implants and TENS devices for chronic back pain. 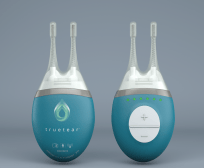 TrueTear is the first device to use the principles of neurostimulation for cases of dry eye caused by inadequate tear production. The easy-to-use, portable TrueTear device is completely drug-free and does not involve using any preservatives or chemicals in the eye. 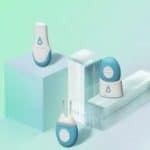 When the TrueTear unit’s disposable tips are placed inside the nose, they deliver gentle pulses of energy to the nerve in the nasal cavity, near the bridge of the nose. This sends a message to the brain, which then sends a message to the tear glands in the eyelids to produce more natural tears. The treatment can easily fit into your daily routine and it works quickly. In only a few seconds per day, TrueTear can turn your eye’s natural tear system back on, providing significant relief from dry, irritated eyes. TrueTear can be used to enhance the effects of other dry eye treatments, or to help you if you have reached a plateau in your current treatments. If you are interested in learning more about TrueTear, please call our office at (860) 233-2020 to schedule your appointment.